Leading scorer James Collins should be fit to face former side Swindon Town this weekend according to boss Nathan Jones. 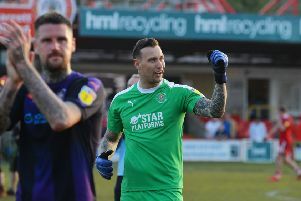 The summer signing from Crawley Town, who has already netted five times in the league so far, had to be replaced after just half an hour of the goalless draw at Lincoln City last week with a hip injury. Collins is one of four players up for the League Two player of the month award for August after his stellar start to life at Kenilworth Road. The winner will be announced tomorrow, but Jones felt it was well deserved too. He continued: “Of course, after the performances he’s put in, five goals, and his all-round performances have been very good, scoring a hat-trick too. “I think there are a few who have got hat-tricks in the last month, but in terms of us he’s vital. Bar Lawson D’Ath, then Jones has a fully fit squad to pick from, as he welcomes both James Justin and Luke Gambin back from international duty with the England U20s and Malta respectively. Jones added: “They’re both back and fit which is a bonus, both have had a little bit of game time, Luke less than JJ but it was a different calibre of game. “We’re pleased to have him back, it did JJ good really, in terms of getting the game time. “He would have played this week for us (in a development game with Northampton), but when you go away with your country and represent that, it gives you a little bit of a lift as well.